HIGH QUALITY MATERIAL:The briefcase is made of high quality genuine cow leather with durable polyester lining. The hardware parts are made of retro brass alloy/gun-color alloy, these make the leather handbags more luxury. Zipper closure for your security. DIMENSIONS: (L)17.32" x (W)4.52" x (H)12" inch. STRUCTURE: This briefcase contains 1 big inner compartment, 1 cell phone pocket, 1 inner zipper pocket,2 pockets outside, one of with is zipper closure and another is magnetic snap closure. Secure and stylish single gusset construction expands for greater carrying capacity. 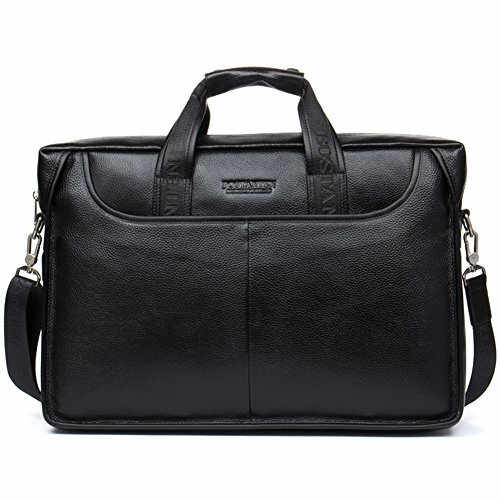 The laptop bag easily holds your less than 17inch laptop, iPad, iPhone, A4 file and other business things. HAND MADE by professional artisans. Adjustable nylon long shoulder strap. Can be used as lawyers briefcase, shoulder bag, laptop bag, or hand carry functional briefcase. Classic design is perfect for business men.